Women's qigong health practice has it's special requirements. 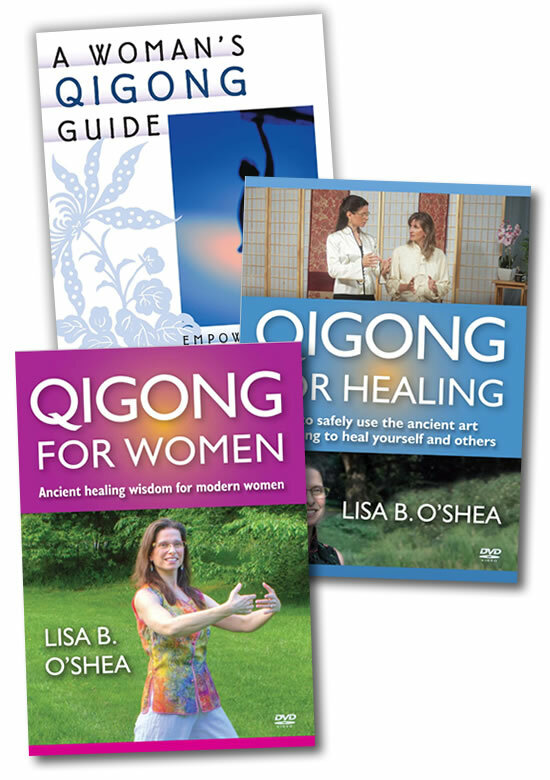 In this remarkable collection, Qigong master Lisa O'Shea teaches how women must approach their qigong exercises, which are quite different from the many routines developed by men, for men. We highly recommend this collection. Bundle contains 1 book and 2 DVDs. Lisa B. O’Shea, certified YMAA qigong master instructor, teaches you how to understand the different aspects of your body’s energy, how to discover problems in your circulation, and qigong exercises to help you improve your health. Qigong (energy work) is a Chinese healing system that has been practiced for centuries. In this easy-to-follow program, Lisa B. O’Shea demystifies this healing tradition in a logical, straightforward manner. You will learn to sense, to develop, and to control this subtle and pervasive spark of life, a skill that often leads practitioners to abundant levels of energy. You will learn to clear stagnant energy in the body, resolve physical, psychological and emotional issues at their energetic roots, and stimulate the body’s energy channels to heal yourself or a partner. Qigong can be practiced by people of all ages, and requires no prior experience or special abilities. A little practice each day can result in a profound improvement in your health. Yanling Lee Johnson, a survivor of China's Cultural Revolution and a longtime Qigong healer and practitioner, addresses the stresses that women of all stages of life face, as they negotiate modern living. Let her teach you simple techniques for maintaining balanced health.